George H.W. 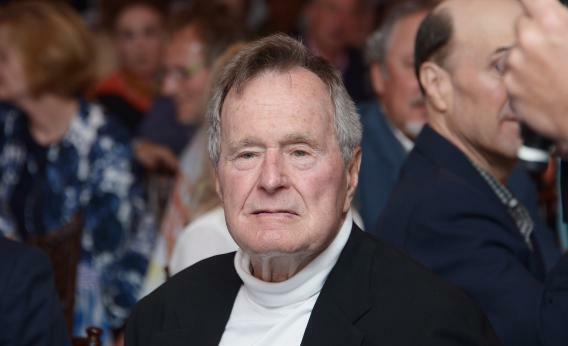 Bush celebrates his 88th birthday on June 12 in Kennebunkport, Maine. Parade magazine (!) asks a delightfully leading question of George H.W. Bush and gets a perfect, bitter answer. PARADE: During your presidency you gave in on your “no new taxes” pledge. You’ve been vindicated in many respects for that decision. [Ed. - He has?] I wonder how you view the “no new tax” pledge from Grover Norquist that seems to be requisite for GOP political candidates. GB: The rigidity of those pledges is something I don’t like. The circumstances change and you can’t be wedded to some formula by Grover Norquist. It’s—who the hell is Grover Norquist, anyway? Why is Bush so bitter? Because Norquist beat him. Go back to 1990, when Democrats ran both branches of Congress. They were the anti-deficits party, as the party that doesn’t run the White House always ends up being. And they wanted to pass a budget that started chipping away at Reagan-era deficits by raising taxes. The president went along with them—halfway, he thought. The Omnibus Budget Reconciliation Act of 1990 raised the top tax rate from 28 percent to 31 percent, and raised the AMT from 21 percent to 24 percent. These were the first real blows against the 1986 tax reform. Democrats also negotiated a series of sin taxes and excise taxes, topped by a 5-cent hike in the gas tax—the second-last tax hike of that kind. 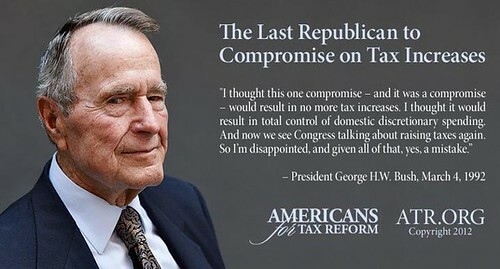 In exchange, Bush and the Republicans were supposed to get spending cuts, $2 for every $1 of new taxes. Grover Norquist of the then-quite-young Americans for Tax Reform rallied conservatives against the plan. Conservatives lost. And then they were politically vindicated. The spending cuts never happened. Democrats cynically ran against Bush for lying about his “no-new-taxes pledge.” (This was an important moment in the intellectual retreat liberals have made on tax policy.) After 1990, as Norquist has pointed out, no Republican in Congress has voted to hike tax rates. And starting in 1994, they’ve won all but two congressional elections and half of the presidential elections. The George W. Bush tax rates are proving nigh-impossible to undo. Norquist was right. That’s the context when Bush says this. He’s not seen as an elder statesman on taxes. He’s seen, by conservatives, as a chump. UPDATE: ATR’s Facebook page has a pret a porter meme for everybody.